Pope Francis and the Archbishop of Canterbury Justin Welby, were seen in an elated mood at the end of Vespers at the monastery church of San Gregorio al Celio in Rome, Italy, Oct. 5. The religious leaders have said that they are “undeterred” by the “serious obstacles” to full unity between Anglicans and Roman Catholics. 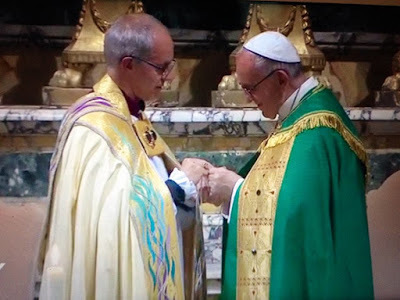 During the service, 19 pairs of Anglican and Roman Catholic bishops from across the world were commissioned by the pope and the archbishop before being “sent out” in mission together.